Posted April 22nd, 2018 by Mike Boyes & filed under Adult Development and Aging, Consciousness, Emerging Adulthood, The Self. Description: Have you travelled? If so, did you pick up any souvenirs on your trip? What did you get? Think back to when you picked out (and bought) or picked up (and pocketed) your souvenirs. What were you thinking about at the time? Why did you pick the thing or things that you picked? Where are they now? If you know where they are or can go and see or hold them again now what thoughts do they bring to mind? 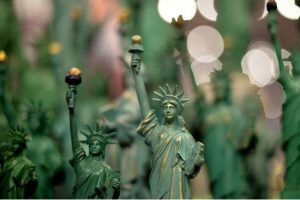 There is a LOT of buzz about “trashy souvenirs” … things like miniature Statues of Liberty or Eiffel Towers, fridge magnets, shells, peddles or rocks, postcards, handicrafts, but the collecting of souvenirs or mementoes vastly predates the “made in China” souvenir shop merchandise tidal wave. The word “souvenir” comes from the French word meaning “to remember.” So, think a bit about the psychological roles that souvenirs (buying them, seeking them, putting them in visible places back home) might play in our lives and then read the article linked below that summarizes what a recently published book (based on academic research) has to say about these questions. Source: Souvenirs 101, Stephanie Rosenbloom, The Getaway, The New York Time Travel Section. There are number of interesting and, I think, important psychological points in the articled linked above about Souvenirs. The categorization suggestions are interesting but tend to focus on concepts that are more descriptive of the souvenir articles themselves than of their psychological roes or significance (e.g., markers, pictorial images, symbolic shorthand, etc.). The historical references are quite interesting. Jefferson and Adams carving off bits of Shakespeare’s writing chair could simply be seen as acts of violence or vandalism (after all there was that little business of the war of independence). However, such a view would sell the American fathers of independence and many modern souvenir hunters short. What about the crusaders and especially those who went off in search of the Holy Grail. Yes, they could have simply been following through on a charge to seek a holy relic but souvenir searching and acquiring can also get us thinking about the purposes or personal impacts of our travels. Souvenirs stand for things. On the surface they stand for the things they depict or represent (go back to little Statues of Liberty or Eiffel Towers) but, perhaps it is much more productive to think of the roles such things play in our processing of our own travel experiences. What did being in New York and seeing the Statue of Liberty or being in Paris and seeing the Eifel Tower (it was very cool) mean to you? Was it just an opportunity to put a check on your bucket list or was it something more? In my own work on identity development and particularly on the identity development of emerging adults (18 to 19-year-olds) I have gathered data and read a lot of other studies indicating that travel does not just open our eyes to the broader world but can also open our eyes to ourselves, to our identities (a BIG part of the developmental work of emerging adulthood and beyond). As the author of the Souvenir book puts it, we acquire souvenirs “not to evaluate the world, but to narrate the self” or as I have said, travelling the world is not so much about site-seeing as it is about self-seeing. So get out there, see the world and bring those experiences back with you in terms of tangible souvenirs but more importantly in terms of memories, reflections and personal insights into yourself (your identity) and the world. What are some of the categories researchers have used to sort out the types of souvenirs people acquire while travelling? How are the souvenirs we acquire related to the paces we have visited (psychologically speaking)? What sorts of roles can travel play in the development of our sense of personal identity? Who (what sorts of people) would you recommend travel to and why? Potts, Rolf, (2018) Souvenir (Object Lessons). Bloomsbury Academic, London, UK.